Published June 24th, 2006	in Misc. The only consolation I can find in this chart is that every time the year over year change crossed the zero line to the upside, it was a great time to buy. 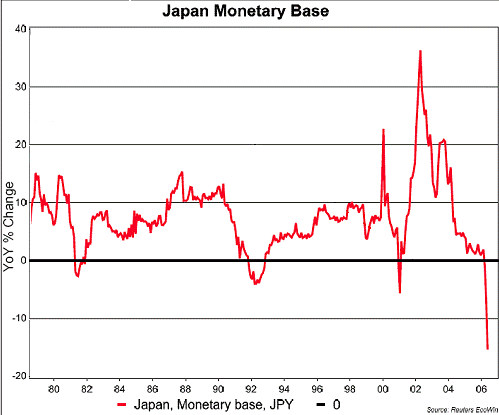 So now the question is, when will the Bank of Japan start to once again increase their monetary base? Or will that matter since the carry trade has been laid to rest with the cancelation of the weak Yen policy? Things are especially muddy because Fukui is embroiled in a scandal (related to a personal investment). If because of this the government of Japan gets more say in setting policy, all bets are off.